Wet weather was a recurring theme for our Canada and Alaska adventures. However the great thing about being retired is that we have the luxury of hanging out someplace a few days longer so we can take advantage of the breaks in the weather when they come. 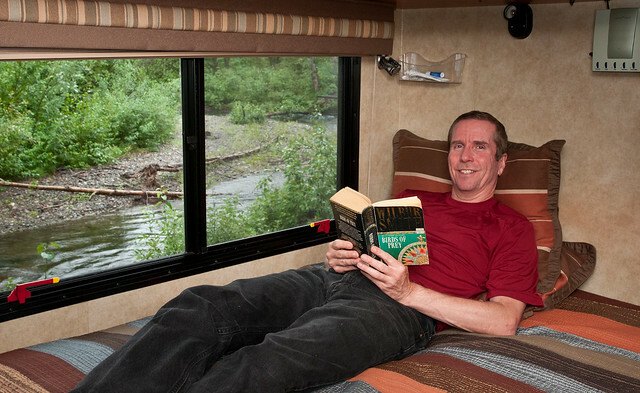 The big advantage to traveling in a motorhome is that we stay warm, dry and entertained while we wait. 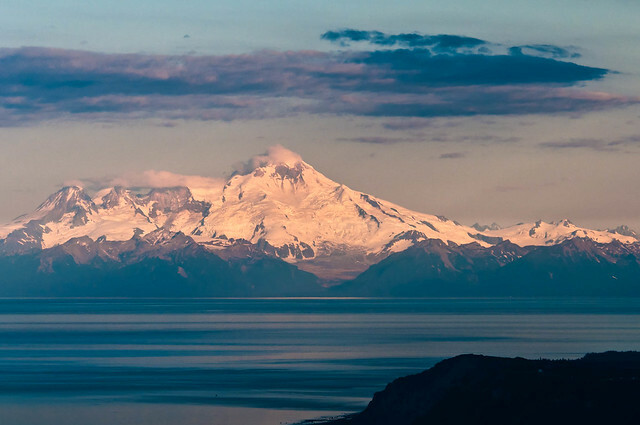 After leaving Denali we headed toward the Kenai Peninsula stopping first in Seward. We watched the weather forecast and chose the most favorable day to book a boat tour, the best way to view the area. 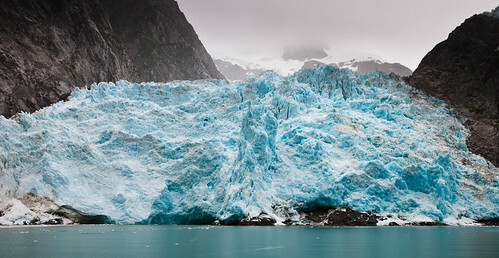 We took a 9 hour tour through Resurrection Bay along Kenai Fjords National Park. The day began cloudy and dry but later deteriorated to the familiar windy rain. 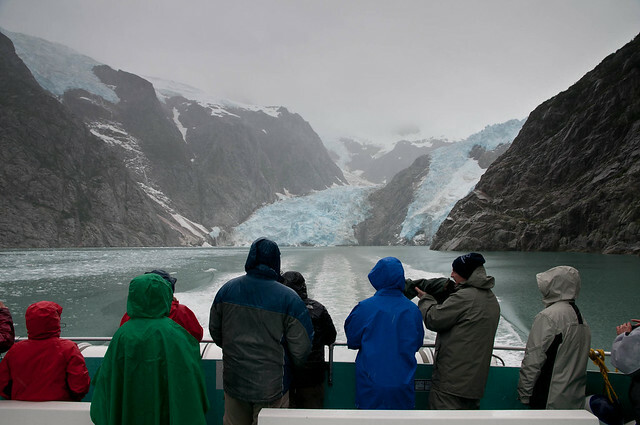 However, we still managed to spend some time out on the deck viewing wildlife and the striking Fjords. 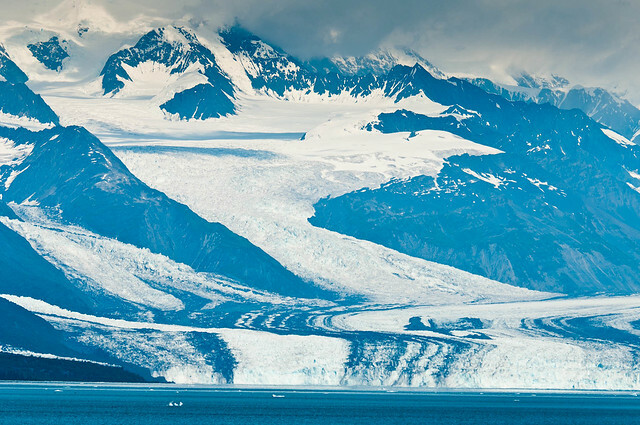 We were on the only boat tour that is long enough to travel as far as Northwestern Glacier. 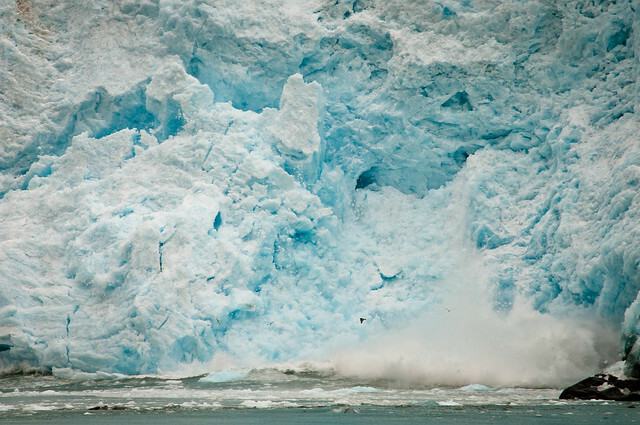 We were hoping to see a “calving” glacier and in this we were very lucky. Shortly after we arrived a large section began its seemingly slow descent crashing loudly into the water below (we have a set of 16 photos on Flickr that can be viewed as a slide show). 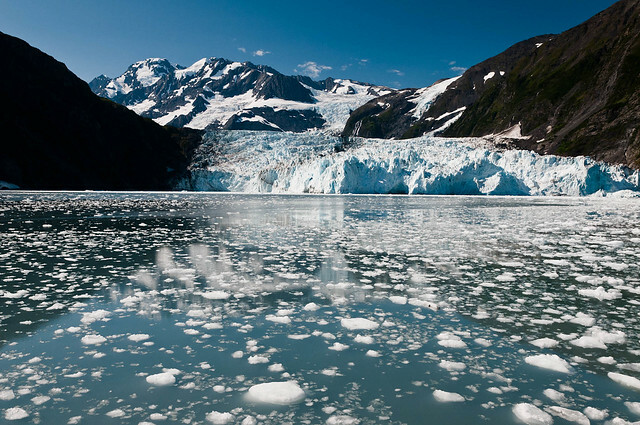 We then headed to Homer and did a 3 day/2 night backpack trip in Kachemak Bay State Park, home of the Grewingk Glacier. One big difference between this park and others is that the only access is by water (or air) so it was necessary to book passage on a “water taxi” from Homer in order to cross the bay. 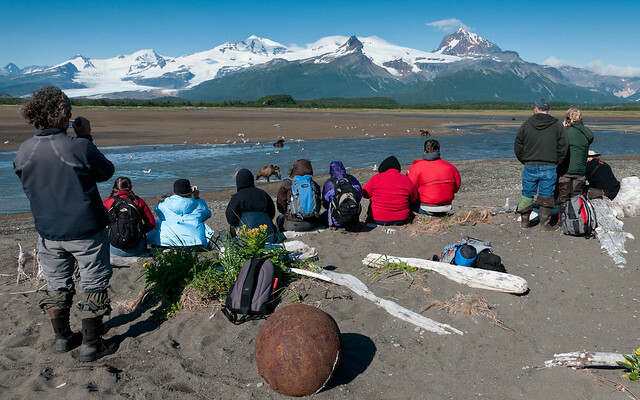 It seemed incongruous to begin a hike to a glacier with a beach landing (complete with instructions to “get ready to hop off, time it with the swells”). 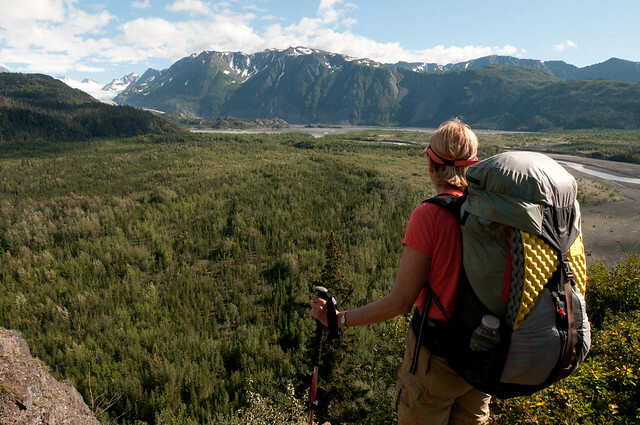 It seems to us that in any other state this 490,000 acre state park would be a national park but the advantage to us was, unlike Alaska National Parks, it has constructed and, for the most part, well maintained trails. The weather was wonderful! Mostly sunny with enough wind that bugs were not too much of a problem. Hiking to the Grewingk Glacier involves crossing the broad, deep and fast moving Grewingk Creek but fortunately the park provides a well maintained tram. Air tours of the area are common so we were used to engine sounds overhead but were perplexed by the sound of an engine very close by and at ground level. We discovered a float plane had just landed on nearby Grewingk Lake and was taxiing to shore to pick up other backpackers. 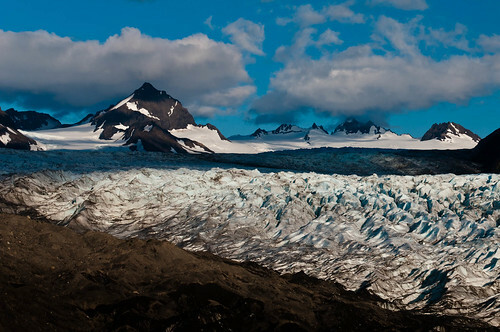 We camped quite close to the glacier that night which had beautiful evening light on it. 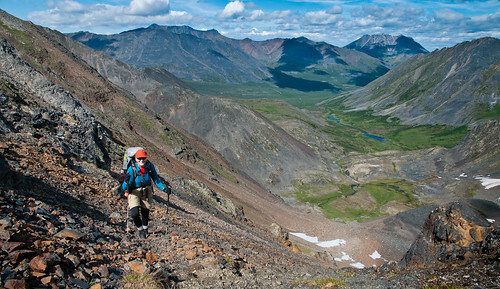 The next day we backtracked some until reaching the junction with the Alpine Ridge Trail. We had been warned that there was no water on the ridge but there was a small creek just before the trails starts to ascend. I didn't feel comfortable relying on a "small" creek so we stopped at Grewingk Creek and cooked supper. I then carried enough water to see us through breakfast (I'm glad I did as the creek was shallow and muddy). We continued up the steep, often muddy, often brushy, trail. 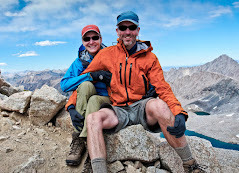 We had planned to camp on the ridge above treeline but it took longer than expected and was getting dark. We decide to stop at the first likely spot but between the steep sides of the ridge and the dense brush and trees it was challenging to find a spot big enough for our tent. Fortunately we found what could have been the only one. The next day we dayhiked the rest of the way to the top of the ridge and the open tundra where we had a more aerial view of the glacier and Kachemak Bay. We then hiked out arriving at our water taxi pick up point a couple of hours early but a simple cell phone call enabled us to request an earlier one. 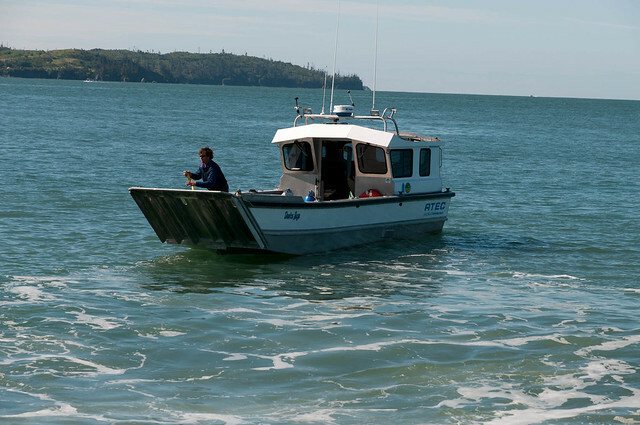 All of our Kachemak Bay State Park photos are on Flickr. John and his camera took a bear viewing flight with K Bay Air Alaska Bear Adventures. to Katmai National Park. 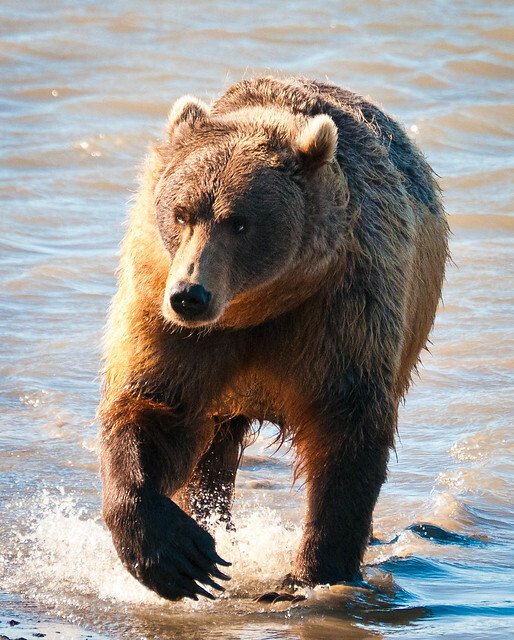 One advantage of going with K Bay Air is that they provide customers with hip waders enabling them to cross a river and get closer to where the bears were fishing. 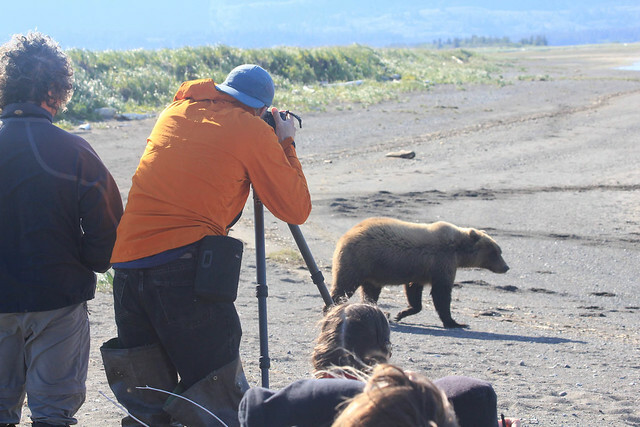 A bush plane lands on a beach allowing tourists to get reasonably close, about 30 feet, to bears gorging themselves on returning salmon. What makes this safe is that a tight group of about 10 people is large enough that a bear is disinclined to mess with. They are accustomed to people nearby and pay them no mind. As a precaution customers are instructed to not pack any fish in their lunches. 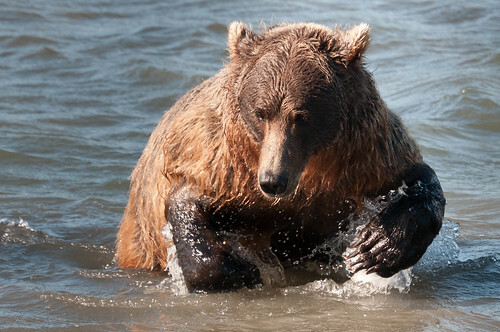 These Brown bears differ from inland Grizzlies because they are larger and live near the coast. 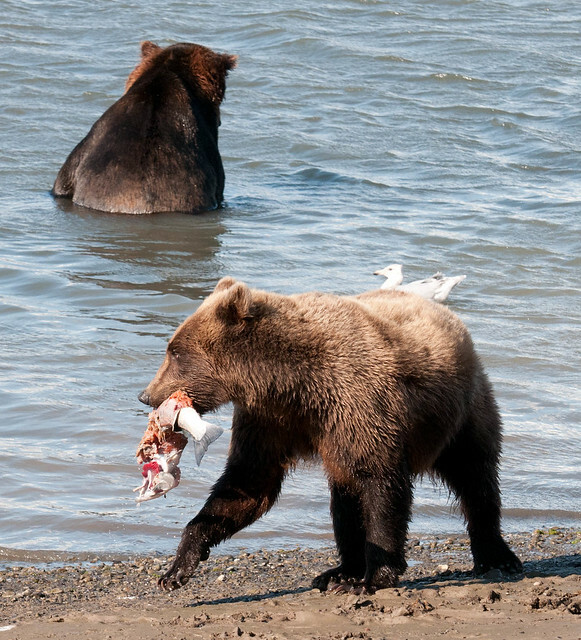 ... stealing fish from other bears. The flight also afforded John some great aerial views of nearby mountains and glaciers including Mt Illiama, Mt Redoubt and the Grewingk Glacier. 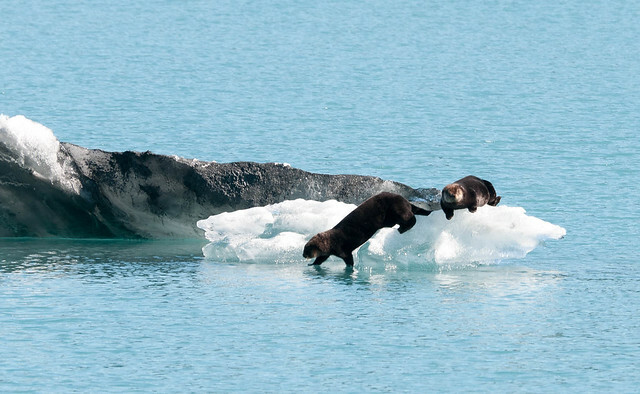 All of our Katmai National Park photos are on Flickr. 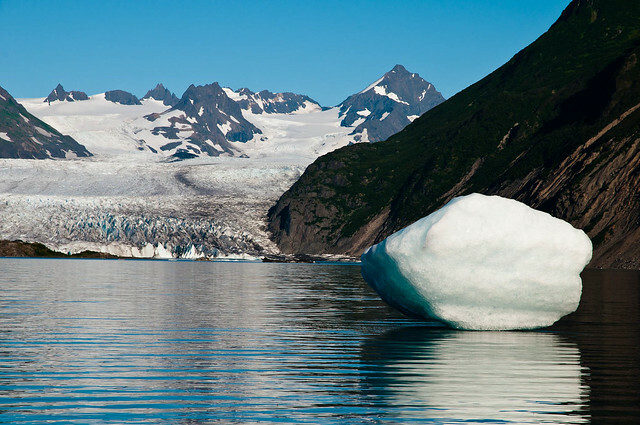 We then traveled to Whittier Alaska for another boat tour, 26 Glaciers in 5 hours, in Prince William Sound. We had arrived at a nearby campground with what we thought was plenty of time, 90 minutes, to get our gear together and drive the 8 miles into town. However something we had not been aware of was that the only road into Whittier goes through a narrow train tunnel and traffic alternates direction every 30 minutes (except of course when there is a train). Luckily we found this out in time. We threw our stuff together and were on our way in 5 minutes. 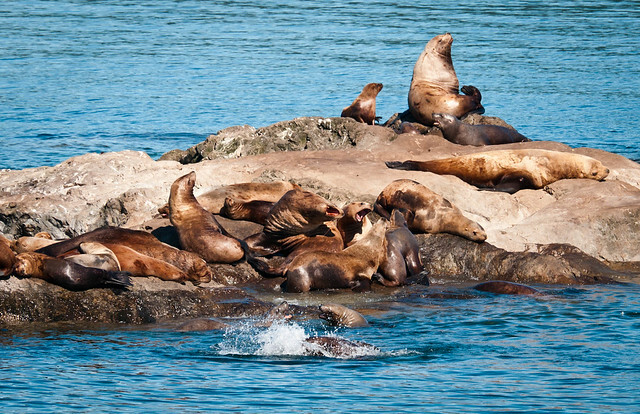 ... as well as countless Harbor Seals and Sea Otters resting on the floating ice bergs. I can't remember the names of all the glaciers and I lost count early on so I can't verify that we saw exactly 26 but we certainly saw plenty! 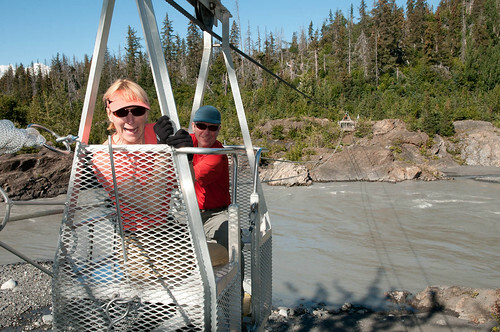 All of our "26 Glaciers in 5 Hours" boat tour photos are on Flickr. 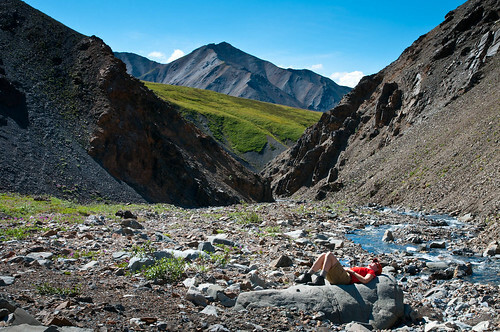 Our next destination is Wrangell-St Elias National Park in Alaska..
John is a long time avid photographer. When I first met him he was taking photography classes at University of Louisville (in Kentucky) primarily for the access to a dark room. He lived in an urban environment and at that time his focus was on form, light and texture rather than readily identifiable subjects. In the fall of 1976 he hoped to attend graduate school in photography at Central Washington University in Ellensburg WA but some financial issues squelched his plans. He still wanted to move west and after living together for several months we made plans to move to Seattle, arriving in Nov. 1977. 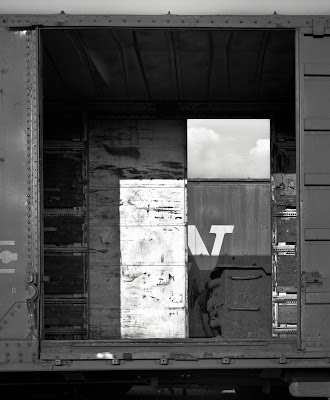 Once he no longer had access to a dark room his photography, beyond basic trip photos etc, fell by the wayside. After we had children the vast majority of photos were of them and taken primarily with a Kodak “point and shoot”. 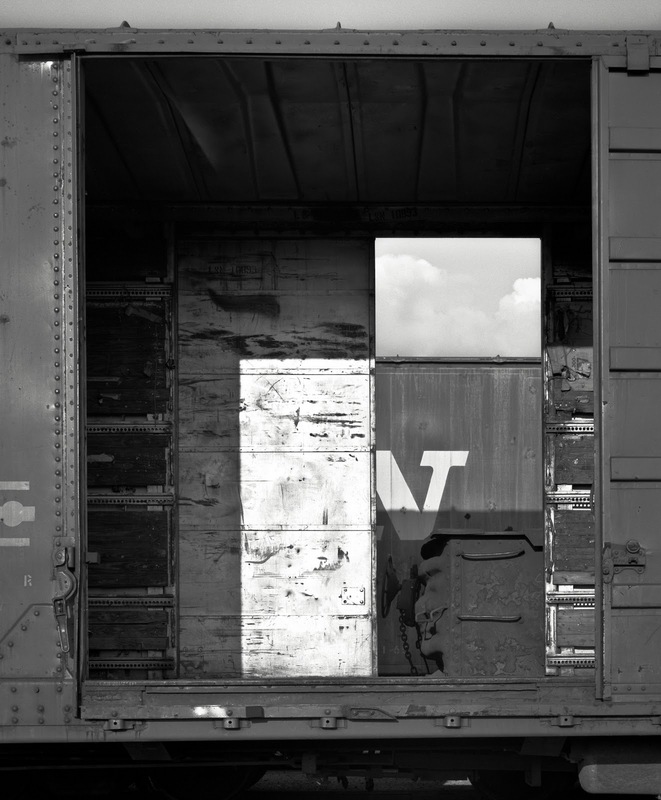 The advent of digital cameras rekindled John’s enthusiasm for photography and in the years since he has amassed a considerable body of work. Improved cameras, better lenses and more advanced photo editing software have enabled him to expand his horizons (and to feed his growing compulsion). His focus became the wild outdoors necessitating his spending more time in the back country and I’ve gotten to tag along. 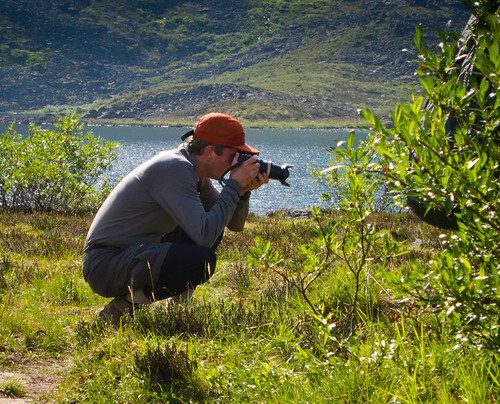 However, hiking and traveling with a photographer requires a certain level of patience. There is no telling what will strike his fancy and require a stop of an indeterminable length of time. In order to be in the right spot in the best light requires we either backpack in or hike long distances often times coming out after dark. Our son Dan once summed this up during a visit while we were planning a day hike. John excitedly said “I can take my camera!” and Dan replied under his breath “That isn’t necessarily an advantage for the rest of us”. 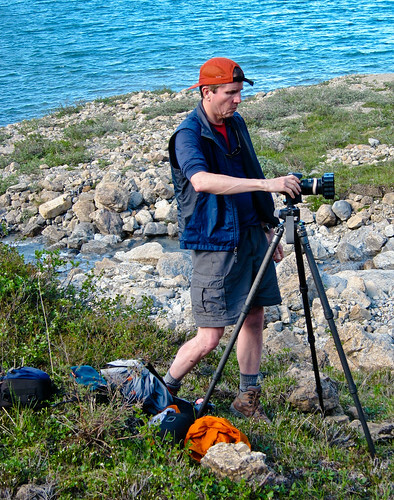 The vast majority of John’s photos now are of landscapes, natural formations and vegetation, generally not of people. And yet it seems to me that I appear in an inordinate number his photos. Now I've never thought of myself as photogenic and I much prefer not getting too close to a camera without a little shampoo, a blow dryer and some mascara…all of which are in short supply in the back country. But that is not an issue for him as, he once let slip, I am there to provide “color and scale” and apparently I can do that just fine with no makeup and dirty “hat hair”. To provide “color” I am expected to wear clothing in “good photographic colors”, warm rich colors that contrast well with the natural environment - reds, oranges, bright blues etc. The challenge is that most functional clothing available in performance fabrics comes in mundane colors; black, grey, navy, and insipid pastels. However, over the years I have acquired a few articles of clothing that fit the bill so I’m wearing the same, some rather old and ratty, garments in nearly every photograph from Alaska to Nepal. To provide “scale” I am asked to follow some directions; “Okay, walk towards me. Go back. Come back…oh wait…okay come towards me”, “Look up…it’s a long exposure so hold still………What? Oh sorry, you can move now”, “Go stand on that rock…Can you get closer to the edge?” etc. 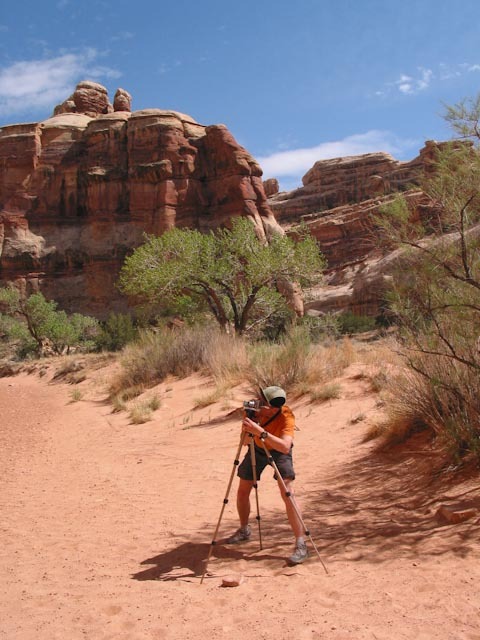 When hiking we occasionally encounter others; individuals, couples or groups, who ask him to take their picture in some scenic spot with their camera. He is more than happy to do so and is not shy about directing them as well, “Okay, you stand over there and you kneel in front…you need to scoot closer…Okay, everybody smile…come on, you can do better than that…better take another one”. Moral of the story - never ask a photographer to take your picture unless you are willing to take a little time. Hiking with a photographer is not all waiting and posing as I am sometimes needed behind the scenes a well. I’ve held a lens or filter not in use, served as a “Voice Activated Light Stand” (holding a remote flash) and shaded his lens. On backpack trips I try to carry more of the shared gear so he can carry more camera equipment. At times I set up or break camp while he is off taking pictures. I’ve even taken food and additional clothing to him when he has gotten so engrossed that he doesn’t notice how cold and hungry he is. Once home and after downloading the hundreds, maybe thousands, of photos he has taken comes the arduous task of editing them. Some are obvious rejects however that still leaves too many excellent photos of any given subject to choose from, each with its own merits especially after utilizing some of the infinite number of adjustments available with “Lightroom”. 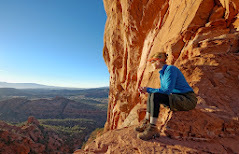 In addition his passion for shooting panoramas and his use of "High Dynamic Range" (HDR) results in multiple photos needed to end up with a single image. I try to help but it can be frustrating as he has to zoom in on each one looking at focus and crispness, do side by side comparisons, make adjustments, etc etc etc. To me they are all good - so just pick one already! The result has been that my goal, to post concise collections representative of our trips on Flickr in a timely fashion, has been nearly impossible to achieve. Unfortunately his compulsion to take pictures didn’t come with an equal compulsion to edit them, he’d simply rather be out there taking more and I don’t blame him, I would too. But I really can’t complain as I know there are far worse things he could be spending time and money on and there are many upsides for me. 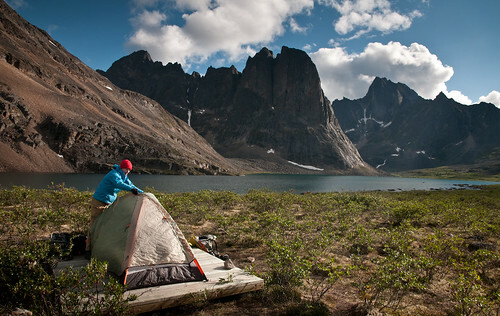 I get to travel and spend a great deal of time in the wild outdoors seeing so many beautiful places! Waiting for him allows me time to be quiet with myself without the distractions of modern day life. And afterwards I get to see countless wonderful photographs that help me to remember all the amazing places we have been. For me his photos capture the “feel” of a place and looking at them afterwards enables me to again experience sensations like the wind on my face and the sun on my skin...but without the bugs or sunburn. I get to relive the exhilaration and the sense of accomplishment I felt at the time…but without the sweat and fatigue. AND I can do it all with clean hair! John's photos are marvelous. Thanks for sharing what goes into producing them.